British company Cox Powertrain talks to SuperyachtNews about the development of its innovative 300hp diesel outboard engine which could prove perfect for superyacht tenders. The advent of high-power diesel outboards, as covered on SuperyachtNews in April, continues apace with the unveiling of the full-size mock-up of Cox Powertrain’s forthcoming CXO300 engine. Reputed to be the most powerful diesel outboard yet developed, the CXO300 takes a new approach in featuring a custom designed and built block rather than relying on an existing diesel engine block converted for the outboard form factor. With private investment raised and with a fund-matching grant from the British Ministry of Defence, an alpha version of the engine was developed with British engineering firm Ricardo who had considerable research on opposed piston engines from work completed during World War II. Sadly, David Cox fell victim to cancer during the process and never saw the alpha prototype completed, but the project continued. “We proved the outboard on a lake to the shareholders and the MoD,” says Reid, “and with some more capital from investors developed the beta engine. At that point, we brought everything in-house, set up our own facilities, and grew our own engineering team.” Indeed, that engineering team – led by Cox Powertrain CEO Tim Routsis, former CEO at performance engine builder Cosworth – includes specialist engineers from Ricardo, McLaren, Lotus, Aston Martin and Jaguar among others. “It’s a very British engineering DNA,” Reid smiles. 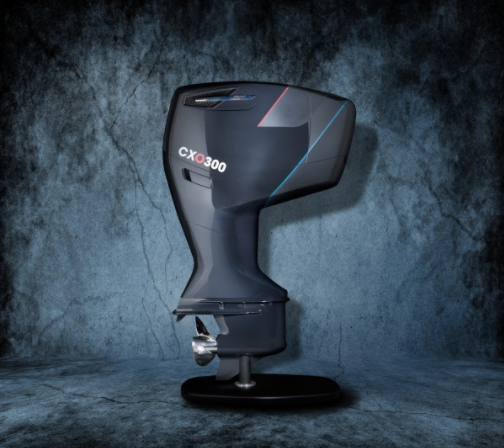 The CXO300 marries the innovative opposed piston block to more conventional leg gear and controls, as a prime requirement was to keep the overall form factor at the equivalent to a similar output petrol outboard. However, the leg elements have been beefed up as the impressive 550Nm torque the supercharged CXO300 delivers, as Reid describes, “melted through standard Yamaha, Suzuki and Mercury legs like butter.” It’s further evidence that the engine has been developed as a medium duty commercial engine that is designed to run 12 hours per day at 90 per cent load, with a 1,200 hour service cycle – thus expanding the outboard’s potentially limited market beyond just leisure or superyacht users. For those superyacht users, the engine offers several benefits. With similar performance and throttle response to a standard 300hp petrol outboard Reid says that the big benefit is in fuel consumption, where users should see 20 to 25 percent less fuel usage over petrol equivalents. Moreover, the torque – roughly 40 percent higher than petrol outboards – means high-performance hulls can reach low planing speeds at less rpm than petrol equivalents. Of course, the main advantage is to be able to ditch the petrol element altogether along with the safety and practical factors that come part and parcel of carrying petrol on board.